Vaishakha Masam is the second month among the Hindu lunar calender. This month is dedicated to Lord Vishnu. 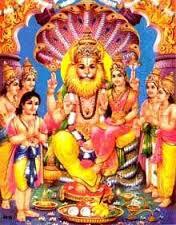 Lord Vishnu’s other name is Madhava / Madhusudhana. This month is also known as madhava masam. Full moon day of this month is known as Vaishakha Purnima. Buddha Purnima is observed on This day. There are two types of lunar months which are used in India. The one type of lunar month (Amavasyant) ends on new moon day and the other type of lunar month (Purnimant) ends on full moon day. This year, Purnimant Vaishakha Masam Starts on 23rd April 2016 and ends on 22nd May 2016, Amavasyant Vaishakha masam starts on 7th May 2016 and ends on 5th June 2016. Performing Goseva, Watering of Banyan tree, thila tharpanam and Udaka Kumbh Daan (donating water) are considered auspicious during Vaishakha month. Akshaya Tritiya, Nrusimha Jayanti and Buddha Purnima are the major festivals during this month.